Writing in virtual reality used to be a difficult task – now the Drawboard pen and app promises to make it as easy as ABC. 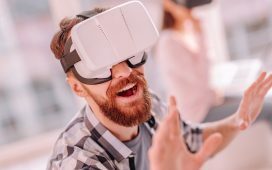 Virtual reality allows us to perform many activities just like in the real world: we can walk around, interact with various objects, and make them move according to our will. However, one very common human activity has remained difficult to perform in a virtual environment: writing. Most of the capacities offered so far by VR peripherals, such as the wand for and the controllers are quite modest. Users find it hard to control their hand movements in thin air and their writing or drawing are awkward and nowhere near their intended results. All the above will be a thing of the past, at least according to the producers of Drawboard – an innovative VR pen – and the dedicated mobile app named Workspace which, when used together, promise to make writing as easy as on a real life board or piece of paper. The Drawboard Pen, which works with Windows Mixed Reality headsets or Rift/Vive via Leap Motion, is used in a similar manner to a stylus used for tablets or professional design software. The product, which is currently available for pre-order, is designed to feel like a regular pen, thus creating minimal distortion to the users’ handwriting style. The Drawboard Pen was created for extended use on various projects and activities. It boasts a battery that lasts for several hours and is easily charged by USB. Also, the device does not have limitations in terms of the surface used for writing on. Any flat and smooth surface in the user’s home or office can be used as a canvas for writing in virtual reality with the Drawboard Pen. The Workspace app is designed to look like a real-life workspace, giving users the confidence to create projects in virtual reality with the same level of skill and proficiency as in real life. The first shipments of the limited production Drawboard Pen will start at the beginning of 2018.